Norwegian Reward won Program of the Year Europe & Africa at the 2018 Freddie Awards and the program’s holiday campaign, the Christmas Advent Calendar, won Best Promotion. Norwegian announces double-daily flights from Stewart International Airport to Dublin Airport beginning April 26, 2018. Norwegian took delivery of its one hundredth direct buy Boeing 737-800 aircraft. Fleet expansion continues with delivery of more than 100 “greener” Boeing 737-8 MAX aircraft. Norwegian today reported its full year and fourth quarter 2017 results. The net loss was –299 million NOK in 2017, while the earnings before interest, taxes and depreciations (EBITDA) was 60 million NOK. Norwegian carried 2.5 million passengers in November, an increase of 11 percent compared to the same month in the previous year. Norwegian’s long-haul routes had a 52 percent passenger growth. The overall load factor was 83.7 percent. Norwegian reported its second quarter results for 2017. The pre-tax result (EBT) was 861 million NOK. This is slightly down from last year’s result, mainly due to higher oil prices and the air passenger tax implemented by the government in Norway last year. 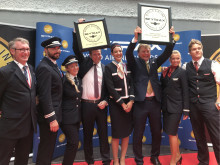 The overall performance was positive in all of Norwegian’s main markets during the second quarter. Norwegian Reward introduced a new feature that allows groups of up to seven people to jointly earn and spend CashPoints. The brand-new Reward Family Account makes it easier for members to pool CashPoints together within groups of family or friends which can then be spent to reduce the cost of Norwegian flights. 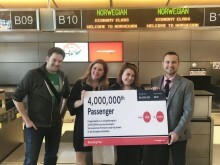 Norwegian celebrated its new service from Oakland International Airport to Copenhagen Airport. 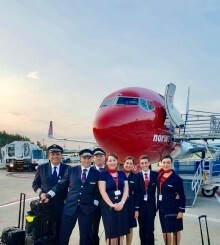 With the addition of this twice-weekly service, Norwegian now offers 21 nonstop routes from the Bay Area to four European destinations.